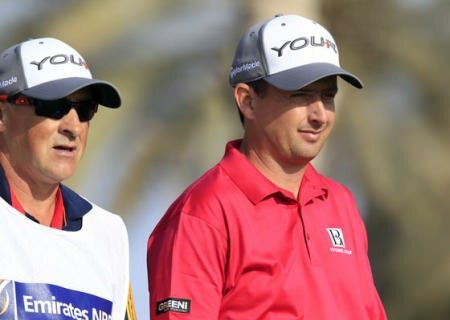 Restored by a break in La Managa with pals, Hoey had nine birdies in a seven under 65 that left him tied for third on 10 under par, just two shots behind leader Rafa Cabrera Bello, who leads by one from James Morrison (66). “I knew the greens would be better today, and I putted well,” said Hoey, who birdied the last two holes. “It was an opportunity today to shoot seven under, which I did. Lawrie delved into his shed to rescue the putter he used to keep his card in the final event of the season in Australia at the end of 2013. But as he tees it up on his final sponsor’s invitation for the time being, he knows he has to take advantage of this week's event to edge closer to winning back his card. Seven under par for his last 12 holes, he had just 24 putts in a five under 67 to share ninth spot on seven under and hopes to secure at least a top 10 finish and a place in next week’s French Open. Cabrera Bello, defeated by Fabrizio Zanotti in a play-off 12 months ago, shot a five under par 67 to lead at Golfclub München Eichenried. He fired six birdies in his opening 11 holes, including chipping in from the drop zone on the 18th hole (having started on the tenth tee) after finding the water with his approach. He made his only bogey of the day on the eighth hole – his penultimate of the day – but a par on the last meant he finished on 12 under par, the same 36-hole total he posted last year. He is a shot clear of Englishman Morrison, the Open de España champion, who signed for a round of 66. Home favourite Martin Kaymer missed the cut after finding the water on the 18th hole. Shane Lowry had six birdies in a 65 to make the cut with ease on five under but Kevin Phelan, who made three early birdies to get to seven under, bogyed the 14th and 18th a 71 left him tied 26th on five unver. Damien McGrane (72) and Darren Clarke (71) are tied 52nd on three under, meaning all the Irish made the cut. Kevin Phelan’s short game responded magically in Munich as he had just 23 putts as well as two eagles inn opening 68 in the BMW International Open.